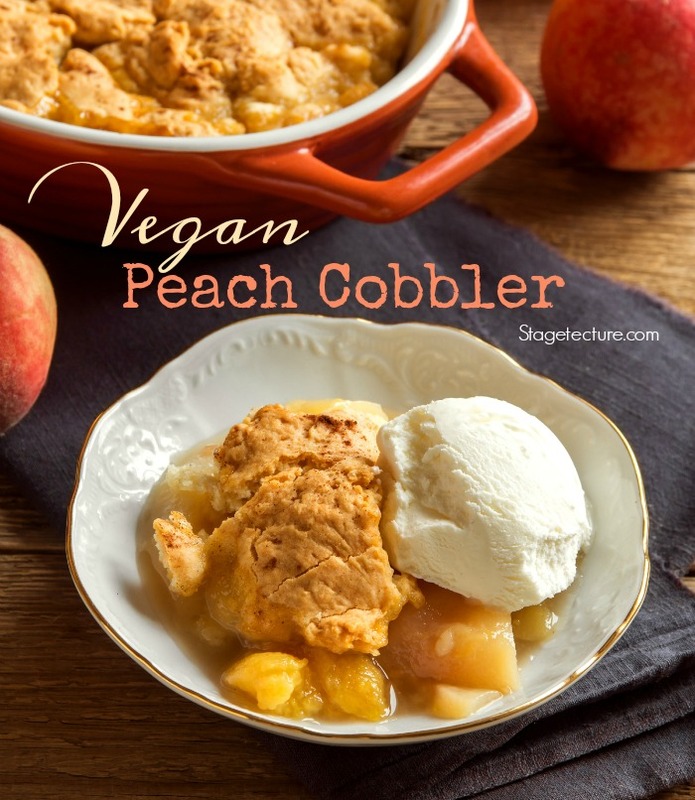 Fresh peaches for the season, let’s make a homemade peach cobbler! Do you remember when your mother or grand mother would bake these after making a huge dinner? Usually, you were stuffed from the meal but when you found out that peach cobbler was made somehow, someway you made room. The warm, caramelized cinnamon peaches drenched with the gooey juice and the top layer with the sweetened crust, would make you melt. Take yourself back to the good times and create this dish again but with a twist, vegan style! Combine the sugar and cornstarch in a saucepan, then stir in the peaches and water. Bring the mixture to a boil for 1 minute, watching and stirring it constantly. When the boiling is done then pour the mixture into a 9” square baking dish and sprinkle with cinnamon. In a large bowl combine the flour, sugar, baking powder and salt. Cut in the margarine until the mixture resembles cornmeal. Then stir in the soymilk until mixed with the previous mixture, then drop by spoonfuls onto the hot fruit. Then put the pan into the oven and bake for about 25 minutes or until the dessert is golden brown. Then take out of the oven and let it cool and enjoy! Note: Add a scoop of vanilla soy ice cream to the top of the pastry for extra sweetness! For more dessert recipes on Stagetecture, click here. « Kitchen Design Ideas you Can Use Now!